Over the past five years, Martin Singh, vice president of maintenance and procurement at Trans-System Inc., has seen an increase in the number of drivers in the industry being treated for sleep apnea, a sleep disorder that causes brief interruptions of breathing during sleep. Those drivers rely on continuous positive airway pressure machines, called CPAPs, that connect to a pump and provide positive flow of air into nasal passages to keep the airway open. Those machines need a continuous source of power. This can be a challenge for drivers on the road, particularly as the required power draw on trucks has increased with the addition of onboard electronic control modules and drivers’ increased desire to operate the electrical components for comfort and enjoyment. Tom DiSalvi, vice president of safety and loss prevention for Green Bay, Wis.-based Schneider, said the fleet is constantly looking for ways to ensure that power demand and currently specs inverters on its tractors. Schneider ranks No. 6 on Transport Topics’ Top 100 list of the largest for-hire carriers in North America. “We have done our best to solve this issue with our standard fleet truck specifications but there are some drivers that still need an additional solution — drivers with a unique device that has a high-power draw or drivers that have limited runtime to charge their batteries between deliveries. We offer those drivers an additional battery pack to supplement their power,” DiSalvi said. To provide drivers with power, the Cheney, Wash.-based Trans-System, which ranks No. 90 on the for-hire TT100, has turned to diesel-powered auxiliary power units, which also use inverters, and specs them in about 80% of the fleet’s tractors. The APUs cost about $10,000, Singh said. The fleet tries to match drivers with CPAP devices with an APU-equipped tractor. When that isn’t possible, the fleet changes idling restrictions on tractors so drivers can receive the power they need, Singh said. To provide guidance on the overall issue, American Trucking Associations’ Technology & Maintenance Council has established a task force to develop a recommended practice for power management strategies for in-cab medical devices, including CPAP machines. The recommended practice will outline the ways to power a CPAP machine within the cab, the pros and cons of each system, the probability each system can provide uninterrupted power for a CPAP machine for 10 hours and an outline of how the tractor should be wired, said Rylar Masco, chairman of the task force and national OEM representative at Purkeys, an electronics manufacturer based in Lowell, Ark. A 2002 study conducted by the University of Pennsylvania and sponsored by the Federal Motor Carrier Safety Administration and the American Transportation Research Institute found that 17.6% of CDL holders had mild sleep apnea, 5.8% had moderate sleep apnea and 4.7% had severe sleep apnea. It is the latest year for which the information is available and ATRI has called for an updated study. A growing number of fleets are making available power a priority. “When you make a decision that it is more important to start the truck in the morning rather than keeping the CPAP machine going, you get into some potential issues in this litigious society,” said Paul Menig, CEO of Tech-I-M, a business consulting firm in Sherwood, Ore.
Several steps are involved in finding the right power source. It starts with the type of CPAP machine and the type of power it needs, which can be alternating current or direct current. DC-powered CPAP machines can plug directly into the cigarette lighter, or power plug, of the truck. Other CPAP machines require AC power, which is available in the sleeper cab via a power inverter that converts DC power from the truck’s battery into AC power, said Mitul Chandrani, senior marketing manager at Schneider Electric, which manufactures Xantrex inverters with North American headquarters in Andover, Mass. ResMed, a CPAP provider based in San Diego, offers DC devices that can be powered by an AC power supply when used at home and an DC/DC converter when the device is powered in the cab. “A DC/DC converter is more efficient when using a battery than an inverter since the converter provides a straight flow of DC current and the inverter is converting DC power to AC,” said Randy Thinnes, area director of occupational health for ResMed. However, it means the CPAP would not receive power. “Managing batteries is like managing your bank account. You have to put more in than you take out; otherwise you’re in trouble,” said Carl Smith, manager of field applications engineering and military sales in the transportation division at Eaton. The amount of power required by a CPAP machine depends on the level of air pressure as well as any devices that may be attached, such as humidifiers or heaters. Smith said CPAP power supplies range from 60W to 200W, and Smith said the battery capacity of a truck should allow a driver to get through the night if other devices are turned off or used occasionally. A universal solution is the addition of a DC-AC inverter, which produces a True Sine Wave AC output that is the same type of waveform that comes out of a household outlet. Eaton suggests a minimum 300W to 400W True Sine Wave Inverter if the CPAP machine is the only appliance to be powered. Increased power demands require larger alternators, larger cabling and more batteries plus more efficient batteries. “Many trucks now have four to eight batteries to handle the electrical requirement when the engine is off,” Smith said. Common inverter sizes for trucks are 1000W, 1200W, 1500W and 1800W. “Inverters larger than 1800W take a serious toll on battery capacity and available alternator current,” Smith added. Kirk Altrichter, vice president of fleet services at Kenan Advantage Group, said that even with an inverter, an optimized engine that kicks on and off to provide heating and cooling could draw enough power on the battery to cut the inverter out while the truck is idling. “It wakes the driver up when it cycles,” he said. Kenan Advantage, based in North Canton, Ohio, ranks No. 25 on the for-hire TT100. Purkeys offers a medical device power source, a separate battery that can provide power for up to 10 hours when fully charged. It charges via the power plug while the truck is moving. “At night, the CPAP is drawing off of the dedicated battery and is not discharging the tractor batteries,” Masco said. Fleets can also use battery-powered APUs or spec shore power as an option with an APU. That can add 20% to 30% to the life of the batteries if plugged into grid power whenever possible, Chandrani said. Tractors can be spec’d with shore power even if they don’t use an APU, but cabs must be wired with the capability. Singh said Trans-System does not spec shore power. “It is a pretty expensive spec and from what I have witnessed, only 20% of the drivers will truly connect to shore power,” he said. Kenan Advantage’s Altrichter said finding locations can be difficult. “There aren’t a lot of places to plug in. You have to have a solution that will work anywhere,” he said. Robert Berkstresser, owner of White’s Travel Center in Raphine, Va., said he offers 25 shore power hookups for drivers, but most go unused because drivers have inverters. Even so, Eaton’s Smith said plugging in is an excellent solution because systems then run off of the grid. He said certain corridors tend to have more plug-in options than others. 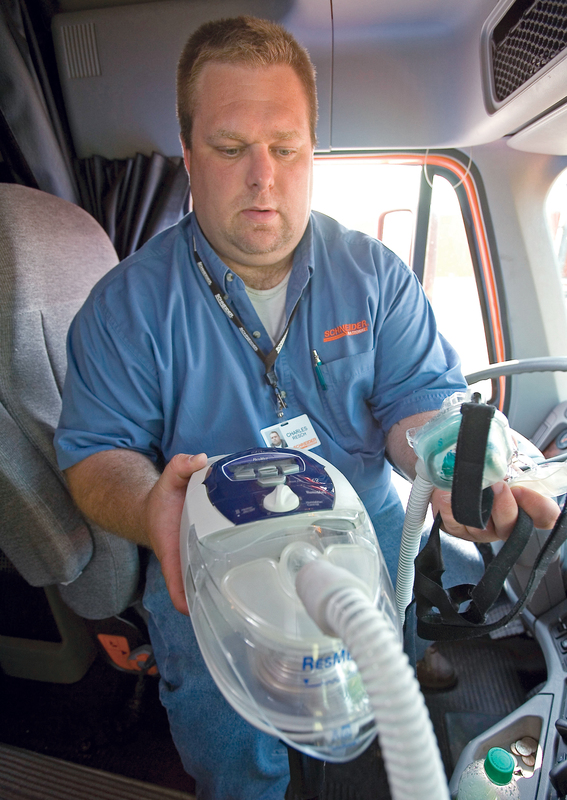 One issue fleets face is that it isn’t always cost effective to equip every truck to support CPAP devices. However, Smith said there is a good chance the next driver a fleet hires will have sleep apnea as well. Plus, more and more drivers are looking for power in the cab. An inverter is required not just for CPAP “but also for other hotel loads that humans in general are so much used to,” Chandrani said.